Satoru Shimoji is an important singer from the Miyako Islands where he has his own Lagoon recording studio and also hosts a live weekly radio show on RBC. He is also the founder of the annual Kuicha dance and music festival. Perhaps most importantly his recent albums Myahk (2012) and Myahk-U (2015) are two of the best releases to have come out of Okinawa for a very long time. Both were reviewed on this blog and I was keen to ask him about these recordings. I managed to catch up with him last weekend when he appeared along with daughter Minami Shimoji at the Niraikanai Matsuri in Ginowan. He was happy to sit down with me and answer some questions not long after he had captivated the audience with his remarkable voice and songs. He is very active and ambitious for his music while at the same time being both extremely polite and friendly – even carrying my chair for me as we found a quieter place to talk with the sounds of the festival still going on in the background. (JP) Your two most recent albums Myahk and Myahk-U are a great step forward and they instantly became favourites of mine. I wonder if this new improved style was planned or did it just evolve by itself? (SS) Even when I was living in Tokyo a long time ago I had already been thinking about making the kind of music that is on Myahk and Myahk-U. But I couldn’t find any pianist in Miyako who could do what I wanted so I thought at first about maybe playing guitars and using computers. Then I found a pianist. My purpose with this music is to find something important which is always there and is close to me and then to revitalize it through this process. This was especially true with the first album Myahk and it felt like a new debut for me because of this attitude of mine. There are various different lights shining such as the light of sound, light of life, and definitely the light outside. It’s unusual to make an Okinawan album with mainly piano and violin rather than sanshin as accompaniment. Was there any special reason for this? My image of the music I make is always simple. I don’t want to have too many sounds but I want it to be wide and deep. I already talked about this with the producer Goh Hotoda and he understood my ideas before we got together to make it. He visited Miyako about 12 years ago when he was living in New York. At first we went out together eating and drinking. I didn’t know he was such a great man at that time. When I was thinking about the Myahk album I phoned him and he asked me how the album was coming along and then we decided to work together on it. I told my musician friends in Tokyo and asked them if they knew Hotoda. When I checked the internet I realised how important he was and wondered if it was really OK for me to work with him but he was very good about it. He asked what kind of sound I wanted and I said I wanted a piano-based album but also with drums and a little bit of sanshin. If you play sanshin too much then it’s like a very obvious Okinawan sound and I didn’t want to do that. Just a little sanshin is enough to make it Okinawan. After that Hotoda came to Miyako with all the equipment ready to record. You also worked with Makoto Kubota on his Blue Asia project didn’t you? Yes. Working with Makoto Kubota was interesting but I think that Hotoda understands me best. It’s nothing to do with money it’s just about feeling and understanding each other. I helped Hotoda’s wife Nokko when she made an album in New York. When the three of us were in Miyako we got together to talk about her album and I suggested that Nokko do some new children’s songs for adults. You used to be a rock musician in Tokyo and then moved back to Miyako several years ago. This must have been quite a change? It’s a long story but when I moved to Tokyo I was working at other jobs, it wasn’t just music. You have to pay for studios to make music so my band and I got together to start running our own studio. We hired a room in a building and practised by ourselves. Sometimes we rented it out to other musicians to get money and some of those musicians became popular later on. We also planned our own live gigs, promoted ourselves and did everything else, then later on we started a live music venue. I went back to Miyako in order to find and express my own roots. But by roots it doesn’t mean you have to play just old Miyako songs. Other songs too that are not from Miyako have had a big impact on me. I try to mix these things to create a new sound of my own. Kazufumi Miyazawa came to this year’s Kuicha Festival in Miyako and we co-wrote a song. I wrote the lyrics and he wrote the music. I have some ideas of how to arrange it and I told him I’d like to include it on my next album. He has offered to help in any way. You presented your music together with your daughter Minami at the WOMEX event in Cardiff, Wales a few years ago. How was that? It was very interesting. Can I be honest? I felt when I was there that I was sure I could do it and that my music was good enough to be accepted by anyone. If I have the right musicians I can do it very well. At the same time I found something I need to improve. Both albums have a feeling of quietness and balladry but if I do more danceable songs to add to this I can make even better albums with a good balance and a more varied stage performance. How about the next album and the future in general? As for the new album, to me the most important thing is to express the atmosphere of Miyako. If you open the world atlas, Miyako is just a tiny point but even so you can send a light from there to the outside world. I think that’s the most important thing for me. Almost every time I perform, like today, there are shamans who come to see me and I talk to them and they say they can feel something special from my voice. They can feel the soul of the islands. 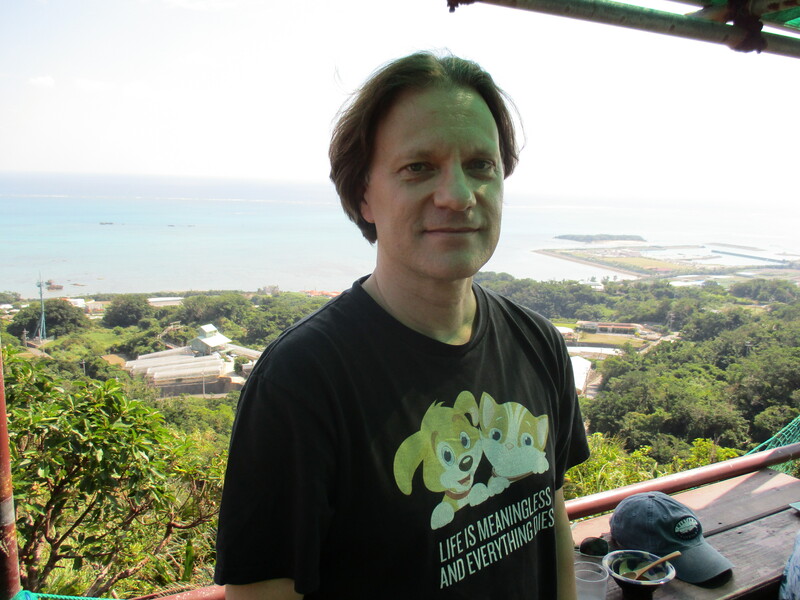 Kirk King is an ethnomusicologist from Vancouver, Canada who has a great interest in Okinawan music. After several years living in Nagano in mainland Japan, Kirk is currently engaged on doctoral studies at the University of British Columbia as a member of their Public Scholars Initiative and is spending some time in Okinawa to do research for his dissertation which will be a study of the great Okinawan musician Rinsho Kadekaru (1920~1999). I first met Kirk about three years ago when he was on another visit to Okinawa and at that time he came to my home to talk to me about my book The Power of Okinawa. This time I managed to turn the tables and sat him down to answer some questions of my own. Kirk is enormously knowledgeable about music but is always eager to find out more and he has a genuine love of traditional music in Okinawa. We could have talked all night and in the end we almost did. What follows are some of my questions along with Kirk’s thoughtful answers. (JP): How did your interest in Okinawa and its music begin? (KK): I lived in Nagano Prefecture for ten years and participated in traditional music there. I performed the accompanying music for lion dancing in my local community, and I wrote my Master’s thesis on that topic. At that point I was really looking to branch out and try a different area of research but still within Japan. As fate would have it, a good friend of mine introduced me to a lot of Okinawan music and lent me a stack of CDs which included a couple by Kadekaru Rinsho which I listened to and was extremely moved by. It was just something about his sound that really grabbed me so I started reading about Kadekaru and his life. I thought it would make an excellent biographical study to look at his life in connection with the music that he made and his particular style of singing and playing. That’s where it all started. Did you find that Okinawan music was very different from Japanese music? Yes, I think it’s very different. Not just the music itself and the elements of composition but more than that what strikes me as the greatest difference is the cultural context. I always think of Okinawan music as a living tradition but I think in the Japanese mainland some of the traditional arts kind of exist in the past and are trapped in time. However, in Okinawa it’s still very much alive and is very much a part of everyday life. How did you become interested in music to begin with? I always loved music ever since I was a kid and studied piano and guitar. But what really aroused my interest in ‘world music’ was that when I was 15 I lived in Indonesia for a year with my parents in West Timor. I started learning a traditional instrument there called the sasando and listened to a lot of gamelan music at a young age. Ever since that time I had an interest in world music and did my undergraduate degree in Music History and then my Master’s in Ethnomusicology. What do you focus on in your dissertation on Kadekaru? My research is a biographical study of Kadekaru which looks at key events and experiences in his life and how they shaped his musical output. I’m not so interested in a complete life history which I think is extremely difficult to do regarding Kadekaru and also I’m not sure it’s particularly suited to an ethnomusicology study. But what I am interested in is collecting as many stories as possible about Kadekaru from people who have something to say about him, or some impression. I’m also very interested in the legend of Kadekaru and how he’s remembered today in Okinawa. I’m also interested in the networks that surround a great artist like him because I believe that to become a person of prominence in a musical world it takes much more than talent. There are other reasons, there are certain circumstances that bring them to that position and there are people that surround a person who validate them as a musician and raise them to a position of prominence. Since he has been such a great influence on musicians, even today, I wondered to what extent he also helped to shape the sense of Okinawan identity which is so closely tied to music and the sanshin. Did you ever see Kadekaru when he was performing? Unfortunately I didn’t. I wish I could have. But I’m fortunate enough to talk to a lot of the people who knew him and they’ve been very cooperative and this is an important part of my research. I’m a member of the University of British Columbia’s Public Scholars Initiative (PSI) which was created last year by the Faculty of Postgraduate and Doctoral Studies. The objective of the PSI is to support scholarship that bridges a gap between academia and the public. It also encourages people to re-imagine the dissertation not as a document that is going to sit on a shelf collecting dust but as something that has impact in the community. For me public scholarship means looking at these people who contribute to my research not as research informants but rather as participants. So I don’t come in as an anthropologist or a musicologist and collect data and leave. I’m really interested in developing relationships and letting their voices come through to tell the story of Kadekaru. In this way I see them also as public scholars in a sense because of their great knowledge and experience. When you are not studying or listening to Okinawan music what other kinds of music do you particularly like? I like all kinds of music. I’m a big fan of 1950s rock ‘n’ roll and have been listening to that lately. I also listen to jazz, especially early New Orleans jazz. I like classic rock and I’ve been listening a lot to David Bowie lately since he passed away because he has been a huge influence on my life in general. Are you playing music yourself nowadays? A little bit, when I have time for it. I started taking sanshin lessons in Nagano out of a research interest to try and understand the instrument better. As much as I like listening to it I find that when I play sanshin it carries me away on a wave for a while. When I come back I feel rejuvenated so I really enjoy it even though I know only about five songs right now. I’m not taking lessons now but I’ve been playing in Vancouver where we have an Okinawa Kenjinkai and an Eisa group. How about your own future? Do you see yourself in Japan or Okinawa or Canada? Well, it’s hard to say at this point. I’m open to the idea of living in Japan and definitely Okinawa would be nice if I can work here. I would like to take a position in academia because I really like teaching and I like working with people. If I could do it with something I really love then that would be the perfect work for me. As an ethnomusicologist, the connections I’ve established with people are very important because that’s how I do my work so I’d like to just continue meeting new people and finding new opportunities. UK musician, composer and producer Guy Sigsworth’s long list of credits includes production and songwriting collaborations with, among others, Madonna, Britney Spears, Alanis Morissette, Alison Moyet and Imogen Heap. He also made significant musical and co-writing contributions to Bjork’s albums Homogenic and Vespertine as well as touring with her as keyboard player and musical director. 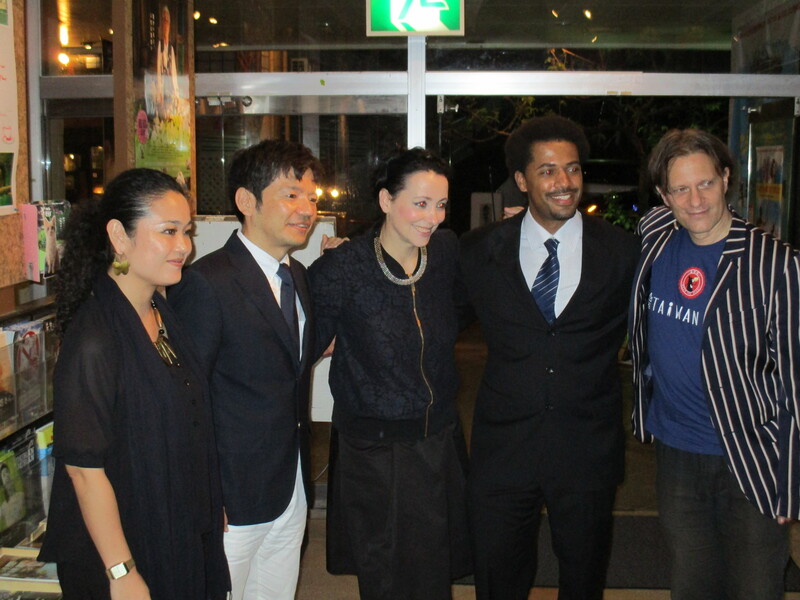 This month he has been visiting Okinawa for the first time along with Norwegian singer-songwriter Kate Havnevik and the pair played a successful concert at Naha’s Sakurazaka Theatre at the end of their Asian tour. 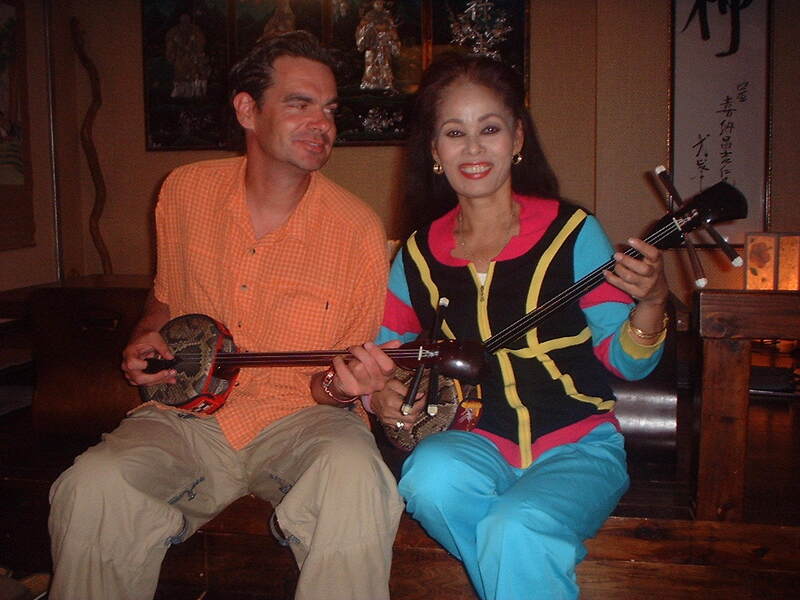 Much less known is that classically trained musician Guy Sigsworth has also had an interest in Okinawan music for many years and was keen to visit Okinawa this time in order to meet and record singer and sanshin player Mika Uchizato for a new music project he is working on. I was lucky enough to be able to put the two of them together and to spend time in the studio with them as Mika flew to Okinawa from her home on Minami Daito Island last week to record some vocals for Guy’s compositions. (JP): How did you become interested in Okinawa and its music? (GS): I remember buying the album Beauty by Ryuichi Sakamoto. It was at the time when I started going out with my wife and it was the one album we could both agree to listen to because of our different musical tastes and so we listened to it a lot. And I just fell in love with that singing and I wanted to know more about it. Curiously, I wound up in Japan playing keyboards for Japanese singer Nokko and in the band was Talvin Singh. He was also, funnily enough, a huge fan of that Sakamoto album. Later, when we got back to London and he was making his own album he actually worked with Nenes on a track. So I’d been aware of the flavour of Okinawan music from that experience and periodically I’ve gone back and tried to listen to more of it. It’s not the easiest music to find in the UK. There tend to be a lot of compilations and you have to import full albums, but I think it’s the singing and the sound of the voice that’s just really special. You came here to play a concert with Kate Havnevik and spend some time in Okinawa but there’s another reason for the inclusion of Okinawa at the end of your tour isn’t there? It’s a kind of busman’s holiday. I think I wanted to record an Okinawan singer and with your help I’ve tracked down Mika Uchizato. I’ve written some pieces which I think are very influenced melodically by Okinawan music and I just wanted to hear an Okinawan artist play with those melodies and take ownership of them and so far it’s looking great. Mika really delivered on two of the tunes I had prepared. So now I’ve got to go home and turn them into finished pieces of music. It’s a real treat and I would love to do more with those voices. Yesterday you introduced me to some of the fantastic male singing which I wasn’t so aware of. I think on the CDs I’ve heard before all the male singing tended to be in the style of what sounds to me more like party tunes and so it was hearing those longer melodies yesterday that I loved. Why did you choose to work with Mika Uchizato? I went through your book The Power of Okinawa and then I was listening to various different artists I discovered there and she stood out with her very strong vocal personality. I like that sort of raspy quality in her voice. I was so used to Nenes which is unison singing, which I love, but I thought that the idea of working with a single artist rather than a kind of track sound of three or four singers was really appealing to me. Is the aim ultimately for you to make your own solo album? Yes, I think so. It’s a kind of journey of discovery. I try and find out as I go along. I don’t always have a clear picture, although sometimes I do. There are times when I know exactly what the album art is going to look like right at the start but this time it’s more of an adventure and I was trying to think how to situate the music in a context which isn’t just ethnic vocal over breakbeat music as I think that’s been done a lot already. So I was kind of wary about doing anything that sounded like that. That’s why so far I haven’t put any drums on anything. It’s not that I won’t but I want it to feel more joined at the hip with actual Okinawan music and then if a beat comes along it comes along. Do you think it’s fundamentally the same working with Mika as it was working in the studio with Bjork or Britney Spears or any of the many other singers you’ve recorded with? Well, it was so different. I actually put Mika in quite a tricky situation. I’d come with very clear ideas of my own and she had to adapt to them which probably wouldn’t have been the case working with Bjork or someone. But she rose to the challenge marvellously. That’s something which is intriguing because she was under a lot of pressure whereas I suppose in my first outing with those other artists I had to take on the pressure myself in order to keep the pressure off them. I have to say that Mika responded to the music very well and was amazingly adept at finding lyrics and vocal phrasings. She did it all so quickly. On your tour with Kate Havnevik you went to China and Taiwan and then to Okinawa. How was it? I really enjoyed Taiwan a lot and then coming here to Okinawa was great. It was actually quite fun here in Okinawa because we had these support artists, MKR Project, and I was able to jam with them at least for one song and didn’t make too much of a mess of it. We literally just went on stage and I didn’t even realise the bass player wasn’t around when we were talking about doing the song ‘Tinsagu nu Hana’. He was suddenly on stage and wondering what key we were in. But in a way you need those seat of the pants moments, don’t you? And so you’d like to come to Okinawa again? I’d definitely like to come back to Okinawa. I have the feeling that it’s a very musical island. It’s a very tricky thing to get right, this balance, because if you are too possessive of your musical culture then you almost close it off hermetically. But if everything goes then it just gets devolved and everybody is doing the same music that you could hear everywhere. One weird effect of globalisation is that you can travel the world to arrive somewhere where they have exactly the same shops and the same brands and exactly the same pop music playing as the place you left. I sense in Okinawa that people are aware they’ve got something special here and they treasure it. It doesn’t mean that they’re not up for innovation and playing with it and taking it to new places but they also realise it’s unique to them. 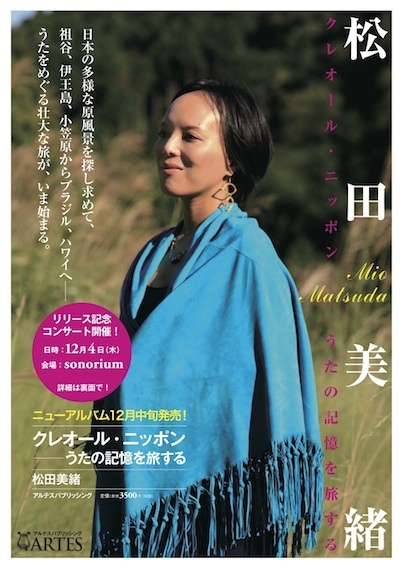 Mio Matsuda is a remarkable singer from Japan. Shortly after she made her debut album Atlantica in 2005 I wrote about her for an article in the UK’s fRoots magazine (now on the Features page of The Power of Okinawa website) and we have kept in touch ever since. Known for her eclectic musical tastes, and equally at home singing in Japanese, Portuguese or Spanish, she has worked with many musicians from around Europe, South America and elsewhere and has gone on to make a number of successful albums. Her latest project sees her returning to her roots as she sings many old Japanese songs that she collected while on her extensive travels both inside and outside Japan. The result is not just a CD but also a book which she has written about the songs and her journey to discover them. Creole Japan: a journey through the memories of songs is scheduled for release in December. Mio found time recently to answer some of my questions about this intriguing work. The interview follows below. (JP): The Creole Japan project has no Okinawan songs. Is there any special reason for this? (MM): I have a deep respect and love for Okinawan music and culture, ever since I was at university. I have visited Okinawa at various times and learned a lot from artists like Tetsuhiro Daiku and Yasukatsu Oshima. In the first place, I respect Okinawa as a place with a different language and history, not as one of Japanese dialect or a region such as Meiji Japan wanted it to be. With so much respect and love for Okinawa, I didn’t include any Okinawan songs as I still have a long way to go till I learn the language and the soul of Uchinanchu, which is the essence of their folklore. The aim of this project is not to make a compilation of songs from all over the Japanese territory, it is on the contrary, to undo the image of Japan through the songs. How did you get the idea for this very ambitious project? I have always wanted to find a repertoire in Japanese while I have been singing a lot in other languages like Portuguese and Spanish. In December 2011, in my hometown in Akita, I found an archive of old folk songs sung by local people. Then I started to encounter these fascinating songs. As for my repertoire, I wanted to find songs of Japan that transcend the images of a closed archipelago. I could have taken some of the well-known minyo, but that wasn’t my idea. I found instead that it was more interesting to meet with rough songs sung by people in their daily work, since those work songs carry the real rhythm of the body, which is now lost a lot in Japan. You must have done a lot of travelling both outside and inside Japan. How long did the whole thing take and which places outside Japan did you go to when looking for songs? It’s been three years since I first had the idea of looking for songs, visiting different regions, interviewing people, arranging and recording the songs and finally writing the whole book. It is a book because I wanted to write all the stories behind the songs. Was there anything in particular that surprised you or was very unexpected during the project? A lot. I was surprised by the fact that a song itself carries lots of stories behind it. Like the Christian songs in Nagasaki, like a Micronesian song delivered to Ogasawara, like songs made by Japanese immigrants in Brazil… there are lots of stories we would never know without looking deeply into a single song. Do you have a favourite song or songs that you discovered? (My own favourites are ‘Song of the Mountain’, and ‘Lemon Grass’ which I can’t stop humming to myself – in my head). Oh how nice! I love these two too. In fact, I love them all, they are precious songs from the time when people were singing in their daily lives attached to nature. All the lyrics are peculiar and somehow connected to the places across the sea. In particular “The Tale of a Small Man” as it is a Christian song made in the Meiji era and I see it as a mixture of occidental and Japanese cosmology. It reminds me of William Butler Yeats’s fairy stories. It became more and more attractive as I discovered little by little the stories behind the song. 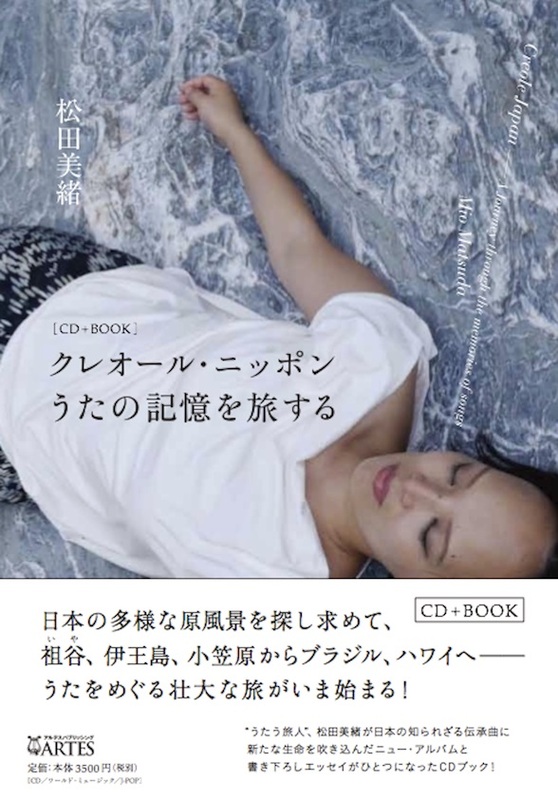 The title of the CD-book (and the whole project) suggests that Japan is not a mono-racial or mono-cultural place at all but has a lot of mixtures and variety. This might surprise some people who don’t realise how diverse it is. Would you agree and do you have anything to add about that? Japan was certainly formed by people of various cultural and racial roots over a period of thousands of years. The diversity has survived in the regional culture. Lafcadio Hearn came to Japan with his mixed roots, animist soul and experiences in Creole regions of the world. That’s why he understood the essence of Japanese culture. This CD-book is in a way, in response to his vision that I admire. You have made these songs come back to life and you sing them in such a beautiful and sympathetic way. Do you see this as a separate side project or do you intend doing more Japanese songs in the future. How about your Portuguese, Cape Verde, and South American work? This project is unique in my singing career but the essence is the same. I always see a song as a story. So I had a very deep look into particular songs and searched for their origins. I had to make it a CD-book because the stories were so dramatic and precious and it was worthwhile to write about them. I hope to translate it into English someday. The songs are not only of Japan, they are also connected to the world where I have travelled…Portugal, Brazil, Cape Verde, Hawaii, Micronesia and so on. They are places where the people who sang those songs have travelled both physically and spiritually. 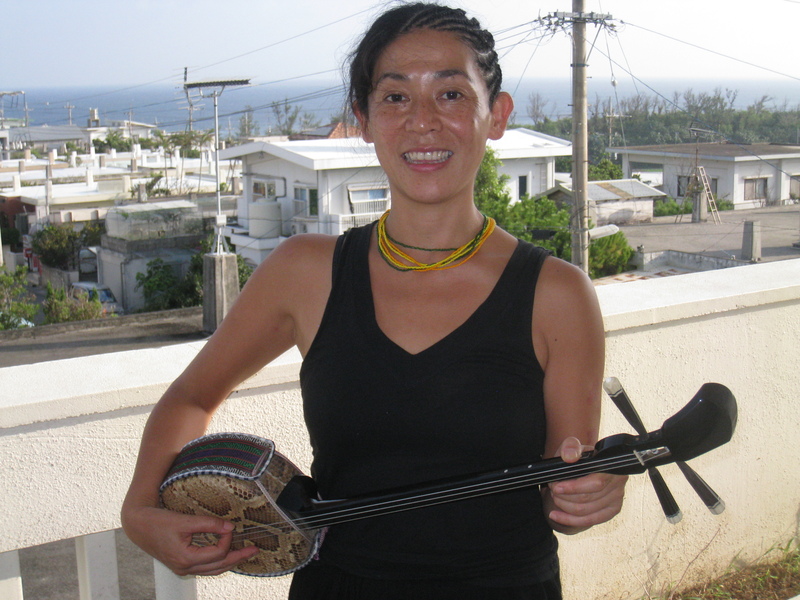 Japanese dancer, singer and musician Yu Tamura has been interested in Okinawan music for several years and is a member of the re-formed group An-chang Project (featured in The Power of Okinawa book, chapter 3). Yu is originally from Tokyo but has recently moved to Thailand. This week she played with An-chang Project at an event on Yonaguni Island before flying on to Okinawa to visit me yesterday on her way back to Bangkok. I took the opportunity to ask her some questions about her involvement as a new member of An-chang Project and about her musical activities in general. Tokyo based An-chang Project were formed by Jun Yasuba as a trio and they released two albums. A compilation Monkey Harmonizing Songs was also released in Europe a few years ago and it put together their first album plus five tracks from their second. The striking vocal harmonies and unusual musical arrangements feature songs from the Ryukyus, Taiwan and some islands of the Pacific as well as a few original songs. Sadly, one of the trio Yoshie Uno died in July 2009 after a long illness at the age of 47, but the group are now performing regularly again with Yasuba and four new members, including Yu Tamura on percussion. Now for one of those coincidences that would seem too far-fetched if it appeared in a novel. At the start of the 1980s I was a teacher at the same international school in England which Yu Tamura attended as a child – in fact, she was one of my class members. Our paths didn’t cross again for 30 years until I discovered through Jun Yasuba that Yu was a new member of An-chang Project. We had both developed a love for Okinawan music quite independently throughout this time and Yu was equally surprised to learn that I was living in Okinawa. We made contact again after all these years and finally met up in Okinawa last year. The power of Okinawa indeed! You’ve just arrived in Okinawa from Yonaguni Island. How did you come to be there? I went there as a member of An-chang Project to take part at a gathering held for the elders of Yonaguni because this Monday (16th September) was old people’s day and they gather every year on that day and have lunch together and just celebrate being old, I guess. They always have children and young people coming to perform and this year they invited us to participate in the event and play a few Yonaguni songs that Jun Yasuba had arranged. This was to encourage the elders to stand up and say “OK, that’s how you arrange the song but we will show you the original version”. Jun Yasuba plays sanshin and is An-chang Project’s only founder member but you have a new line-up now with five musicians. Yes, there are five of us now and we play sanshin, guitar, Ryukyu and Japanese flutes and various kinds of drums and percussion. And of course we all sing because harmonization is a great thing for us. We used to just gather in Yoshie Uno’s bar in Tokyo and sing Taiwanese songs and Yonaguni songs as well as other An-chang Project songs, so it was just like a group of people who like to sing and harmonize. After Yoshie became sick and then passed away I approached Jun and asked her if we could sing somewhere if there was an opportunity. Just to keep the songs of An-chang Project alive and for the memory of Yoshie. It came about at a good time because a friend of mine was organising a summer festival event and so we did a few songs there and from then on we started to be a bit more active. 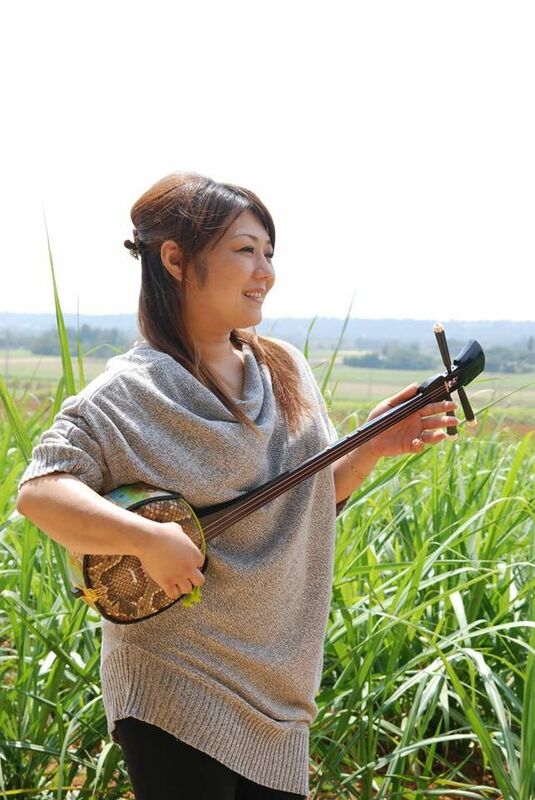 Although you play sanshin you are mainly a percussionist with An-chang Project. Yes. Jun plays sanshin and I can play sanshin and there was already a guitarist so that position was taken. Of course, we needed drums and so I took on that job and I play shimadaiko and various other kinds of percussion. And you knew Jun Yasuba before that? We started working with these new members after Yoshie passed away but I originally met Jun in 1996 so it’s been quite a long time. At that time I organised an indigenous concert with a group of friends. At first the idea was to invite musicians from the Bunun people of Taiwan but it wasn’t enough to just have them so we decided to broaden it and we invited musicians from Okinawa and from the Ainu of Japan and Native Americans. Also, my mother was one of the first people to introduce new Taiwanese cinema to Japan and she was writing about Taiwan contemporary cinema. Jun had read my mum’s book and was actually a fan of her books. They met during the concert and Jun found out that I was her daughter. But besides that we became friends and I saw her again in 1997 when we organised a concert again with different artists from around the world. You are a musician with An-chang Project but you originally trained as a dancer didn’t you? Dancing is still my main thing really. In fact, I do some dancing with An-chang Project too and I just did some in Yonaguni. There’s this dance from Okinoerabu which Jun taught me and I joined Shisars and An-chang Project a few times to do it. But when I began dancing I went to New York and learned many different styles of dance. Maybe too many! During that time it was the era of Madonna and Cyndi Lauper and Flashdance and Footloose so I imagined that if you wanted to be a dancer then you had to do the things people did in those films. You had to work on the streets and maybe go to auditions. And it was Michael Jackson’s Thriller that really got me to dance. I spent six years in America learning to dance and just doing odd jobs to make ends meet. And before that, of course, I was in England for ten years at Summerhill School. Did you also want to be a musician at that time? I always loved music and I also wanted to play an instrument. Even at Summerhill I gave it a go on the drums and played piano. After school I wanted to play guitar because it was easy to carry around and you can play any kind of song. I was listening to Joni Mitchell but the friends around me were listening to heavy metal and Nirvana and things I didn’t really want to play on the guitar. Then Yoshie and Jun started teaching me sanshin in Tokyo. It was kind of simple and the environment was good for me. They taught me the songs of Yonaguni because every year there’s an exam that they do mainly for the children so that the kids will learn the songs of the island. So I started learning those songs for the exam and from then on I really stuck with it, especially after Yoshie passed away. I just wanted to continue with it even though I knew I might never become that good at it. I feel like it’s a gift or something that Yoshie left with me and I don’t think I will ever stop. Will there be a new album sometime? We’ve been talking about recording a few songs just to sharpen up our skills and to update the sound. Everything that we play, my bible is the two CDs that An-Chang Project released. I listen to them and I copy all my taiko playing from there. Is there any special reason why you’ve just moved to Thailand? Why I moved to Thailand is quite simple. It was partly for economic reasons because the cost of living is cheaper there and I just wanted to try and put some money aside for my own projects such as my dance theatre pieces. I also have several friends in Thailand and they are all into theatre. It was just easy to live there and I knew the country well enough and already had friends there. And I just wanted to be in Asia. I know Japan is in Asia but this is different. Living in another country broadens your perspective about Asia. So now I’m thinking about cultures and traditions and songs and why it’s important to keep them alive. Not to preserve them as they are but to keep them alive by changing them and utilizing them in a positive way. Is it a problem maintaining contact with An-chang Project? That was one of my concerns when I was thinking about moving away from Japan. I needed to have easy access to be able to join An-chang Project whenever they were playing and also to my family just in case something happens. We’ll see how it goes but it hasn’t been a problem up to now. My interview with Keiko Kinjo was published in the Japan Times last week (22nd). This photo of her was taken shortly after our talk. Pascal Plantinga is a Dutch pop eccentric whose musical experiments span several genres. He has just released three records simultaneously on the German label Ata Tak. All three are completely different and all are equally intriguing. Promises of Pleasure is a studio recording of intimate soundscape songs. Even Angels Take Detours is a live performance by Plantinga with a band in New York and includes a 20 minute film as a bonus DVD. Of special interest to us though is the third of these records Yonaguni Shonkane/Bashofu which consists of these two Okinawan songs performed with lush electronic arrangements and featuring vocals by Keiko Kina. How did you come to know Keiko Kina? The first time I met Keiko was in October 2005, at Chakra, where she was doing her nightly performance as a member of Champloose. I already had a few CDs of Shoukichi Kina & Champloose. I was intrigued by the high pitched sounds of the female voices and determined to experience this otherworldly phenomena right at the source. That night Keiko did a few songs all by herself, and I was mesmerized, not only by the beauty of her voice, but also by the glow on her face when she sang, eyes closed. She must have noticed me somehow because when the show was over, she introduced herself and was curious about why I was there. She told me, most non-Asians who visit Chakra are very specific music lovers and many times musicians themselves. 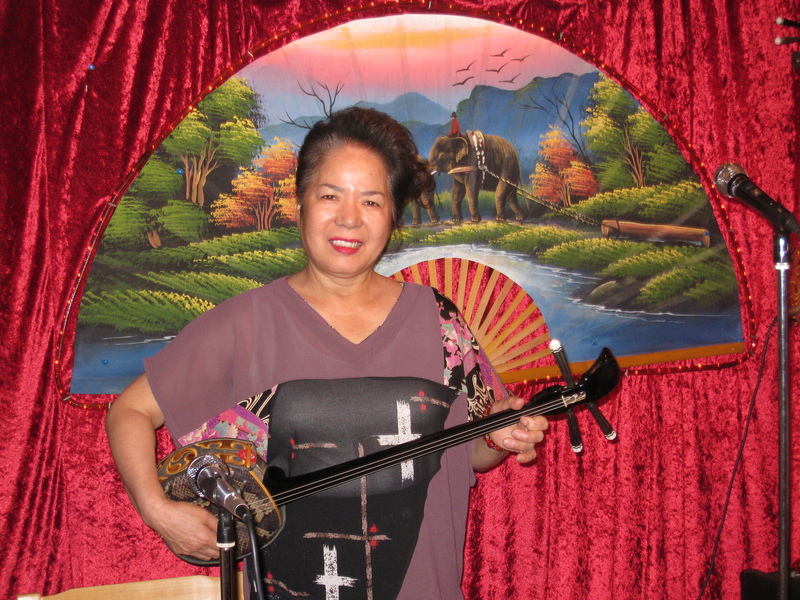 I told her I had just bought a sanshin and Keiko invited me to come back the next night, so we could play together. Which I did. That night I also gave her two of my CDs and Keiko immediately offered to sing on my next record. They were not really chosen. They chose me. I had prerecorded some rough arrangements of new songs with Keiko in mind for my third trip to Okinawa last year. However, Keiko, who had just opened a new club, Ohana, felt more comfortable playing a few songs from her own repertoire. Much to my delight one of the songs she suggested was ‘Yonaguni Shonkane’, a classic I knew from the Yaeyama singer Isamu Asato. Keiko also sang a version of ‘Bashofu’, a very popular Okinawan song but not really a favorite of mine. And as great as Keiko sounded, I could not imagine wanting to do anything with the recording of that song. So how did you come to record it? Well, one thing I enjoy doing in Naha, is taking the monorail. We don’t have monorails in The Netherlands, so to me it’s quite an exotic means of transportation. What makes riding the monorail in Naha a real extravaganza, are the station jingles. On every station you hear an electronic, quite synthetic melody from an Okinawan song. I thought it would be fun to ride the monorail from beginning to end, and record all the jingles. Just to see if I would recognize them all. Back home, in The Netherlands, I listened to the recordings I had made during my trip and discovered that the monorail jingle version of ‘Bashofu’ was in the exact same key as Keiko had sung it when I recorded her performing the song. I tried to synchronize the two and was quite surprised how well they blended together.Then I went back to the original arrangements of the songs I had made before the trip to Naha. And realized that, with a few modifications, I could shape Keiko’s versions of ‘Yonaguni Shonkane’ and ‘Bashofu’ into the arrangements of my own songs. And that’s what I did! Have you ever been to Yonaguni Island where the song comes from? I have not been to Yonaguni yet, but when I hear the sounds of ‘Yonaguni Shonkane’ I imagine myself sitting on the beach, looking at the waves, pondering about the mystery of the Yonaguni underwater structure, when suddenly a mermaid-like character rises up from the sea. It’s Keiko, singing and sort of mindlessly strumming her sanshin. I observe her appearance, and when it occurs to me I should approach her and reach out for her, Keiko sinks back into the waves. Leaving me empty handed. As you may notice, the song has no real intro or ending. It’s there and then it’s gone, abruptly, just as I imagine this scene. Are you happy with the way the recordings turned out? The result is exactly what I dreamt it to be: exotic minimal electronic music with Keiko’s enchanting voice on top of it all. And, even though I never meant to turn these two Okinawan tunes into new electronic music, I am very happy I ended up doing it. How did you get the idea for the record? The day after I recorded with Keiko I took a long bike ride around Naha. When I rode by the Okinawa Prefectural College of Nursing, I noticed 3 young ladies, holding little pompoms, standing in front of the school. I jumped off the bike, asked if I could take a picture, then took it and continued my ride. Later, I realized I had made a photograph for one of the most exciting record covers of all time. Now I only had to produce the right music to go with it! Working on these songs was a great stepping stone in my ongoing quest for the ultimate sound. The songs really grew on me and I thought I should give them a chance to have an existence in the real world as a record. Which turned out great; within a week (before the release date!) the record was played on 4 different radio stations in The Netherlands and England. It comes in a very limited edition of only 250 copies. This record is not for everybody, but I trust there are 250 people on the planet who will enjoy the living daylight out of it. Consider it a musical postcard from Okinawa sent to you by your personal friend Pascal. These recordings are only available as records or downloads. Where can people buy them? The record could be available at your local record store, but you can also order it directly from the record label www.atatak.com and in Japan from http://www.suezan.com/ It can be downloaded from iTunes. I also have a brand new website: www.pascalplantinga.com It contains no information whatsoever, but tells you something, somehow.